Crop yields are reduced by both nutrient deficiencies and pests, so one can only imagine what the reduction in yield might be if nutrient deficiency caused increased pest levels. Potassium deficiency makes soybean plants more nutritious for soybean aphids, but the threshold at which the effect occurs has not been pinpointed. Photo courtesy of Horst Bohner, OMAFRA. Crop yields are reduced by both nutrient deficiencies and pests, so one can only imagine what the reduction in yield might be if nutrient deficiency caused increased pest levels. The individual effects on soybean yields of the combination of potassium (K) deficiency and soybean aphids still need to be teased apart. However, researchers do know that soybean aphids produce more offspring faster on K-deficient plants than on K-sufficient plants, and they have some idea why. When soybean aphids first arrived in North America, people began to notice that there seemed to be more aphids on yellowish soybean plants than on healthy plants. What was causing this phenomenon? Large-scale field surveys of soybean aphids and soil and tissue chemistry by University of Wisconsin-Madison entomologist Dr. Claudio Gratton and his postdoctoral researcher Dr. Scott Myers, and by Michigan State University entomologist Dr. Christina DiFonzo and her graduate student Abigail Walter, indicated a correlation between aphid population growth and soil and soybean-tissue K. “The aphid populations tended to grow the fastest when leaf K tended to be the lowest and soil K tended to be the lowest in a particular field,” explains Gratton. The presence of soybean aphids increased soybean cyst nematode infection on roots of resistant varieties.Photo courtesy of Dr. Felicitas Avendaño, Grand View University, Iowa. 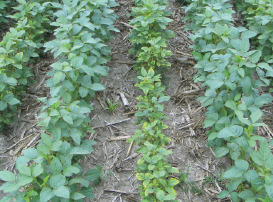 The results confirmed their hypothesis that K-deficiency was beneficial for soybean aphids. “When we looked at the aphids in these little plots and in the clip cages where we knew nothing else had been changed except that we added K or not, there was a very strong and significant effect of those K additions on aphid population growth. The effect was such that if you didn’t add K, the aphids did a lot better than if you did add K,” says Gratton. 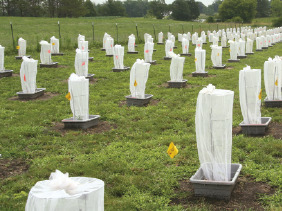 The aphid population growth was better on K-deficient plants, i.e., in plots that received no K amendment, because many more offspring were produced than in plots that received K amendment, whether the resultant soil-test K levels were moderate or high. It is important to note that soil-test K values may not be exactly comparable among studies and regions, depending on the measurement methods used. In a similar experiment, DiFonzo and Walter amended a K-deficient, sandy soil in a Michigan field. “The K levels were extremely low to the point where the soil scientist here said it would take perhaps three years to bring levels up to what he would consider to be good,” says DiFonzo. “They were all well below the Michigan State University recommendation of 150 ppm.” In fact, their amendments only increased the soil-test K levels slightly, so that K-deficient soybean plots had, on average, 29 and 42 ppm soil-test K in two consecutive years, and amended plots had on average 34 and 53 ppm soil-test K in the same two years. In a larger-scale study, Gratton and colleagues from Michigan, Wisconsin, Iowa and Minnesota looked at how the size of soybean aphid populations is related to aspects of the landscape such as the size and number of areas with different vegetation types, e.g., corn fields, soybean fields, wetlands and forests. “One of the really interesting things that we found was that when you looked over this entire upper Midwest area, the aphid populations tended to be the highest in areas that tended to be dominated by corn/soybean rotations,” states Gratton. And those landscapes tended to have the lowest K levels in the soybean leaves. Gratton thinks that this might indicate that the corn/soybean rotation tends to deplete soil K, particularly if growers do not do regular soil tests and amend their fields as needed. “If you are in that kind of a rotation, then you may be at increased risk for having K deficiency and therefore have higher aphid populations. So you should be a little more vigilant in what those values are for your own fields,” he suggests. As researchers learn more about how soil fertility affects various insects and diseases, nutrient management could become an important aspect of integrated pest management. The research suggests that by ensuring soil K levels are adequate, growers may be making conditions less favourable for soybean aphid reproduction. 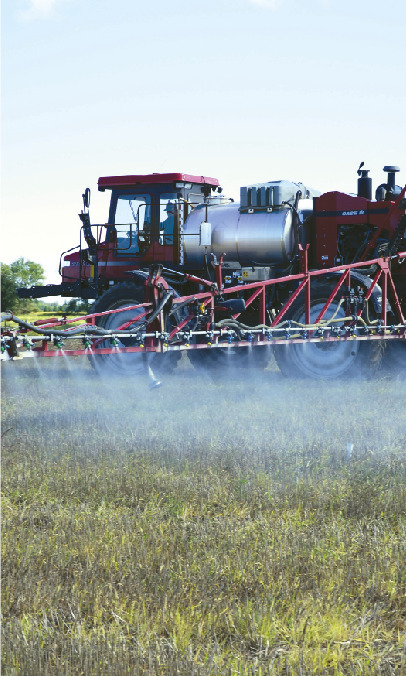 This could delay or reduce the risk of soybean aphid levels exceeding the economic threshold. Potassium deficiency can be highly localized and has several potential causes. Photo courtesy of Horst Bohner, OMAFRA. If a soil test indicates adequate levels of K, potash application is not necessary. 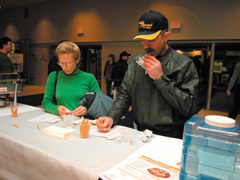 According to OMAFRA’s Agronomy Guide for Field Crops, ammonium acetate soil-test K results of 0–60 and 61–120 ppm in Ontario indicate low and medium levels of K, respectively. These soils should receive potash amendment. Amendment is not recommended for soils with levels greater than 120 ppm. Microplots were independently infested with soybean cyst nematode (orange flags) or left uninfested (yellow flags). Five soybean varieties were grown inside exclusion cages, with one plant per cage. Soybean aphids were added to half of the cages and monitored regularly for one month. Photo courtesy of Dr. Felicitas Avendaño, Grand View University, Iowa. Soybean aphids may reduce the efficacy of soybean cyst nematode (SCN)-resistant soybean varieties, says Dr. Felicitas Avendaño, assistant professor at Grand View University in Iowa. As a postdoctoral researcher working with nematologist Dr. Greg Tylka and entomologist Dr. Matt O’Neal at Iowa State University, she performed experiments by putting soybean aphids, SCN, or both on soybean varieties that were either resistant or susceptible to SCN. The aphids and SCN did not seem to directly affect each other’s life cycle, and aphid population growth did not seem to be affected by the presence or absence of the nematode. Interestingly though, “soybean aphids affected the level of resistance of the plant to the nematode,” says Avendaño. Few nematodes infected the resistant varieties when aphids were not present. But when aphids were there, more nematodes were able to colonize the resistant varieties. This interaction also affected the soybean yield. The SCN-resistant plants had similar yield with and without the nematode. “But when you had the nematode and the aphid together, the yield was reduced,” says Avendaño. To maintain soybean yields, people who know that they have SCN in their field and are planting SCN-resistant varieties might be wise to keep a sharper eye out for aphids.